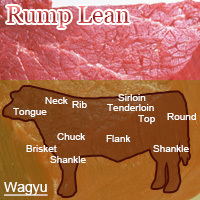 Lean beef rump is located behind the sirloin right above the thigh. It is best for steak and roast beef. In addition to standing in a low fat source of protein it is high in vitamin B6, pantothenic acid, iron, and zinc. It is can also be used to make carpaccio. The calories in Japanese Beef Rump Lean per 100g(1cut ) is 211 calories. Japanese Beef Rump Lean is calculated to be 211Cal per 100 grams making 80Cal equivalent to 37.91g with 19.2g of mostly protein、13.6g of fat、0.5g of carbohydrates in 100g while being rich in vitamins and minerals such as Vitamin B12 and Zinc.